I think my seasonal allergies may be kicking in today. I woke up with a terrible headache, and after a couple of pain relievers, it still isn't going away. This will be a (relatively) short post. This is a card-within-a-frame, though it's not my intent to give it away as such. ;) I bought the frame at TJ Maxx to use as a prop. Not liking it too much, though, as it detracts from the card. Ah, well. It was worth a try. There, you can see it better now. No close up shots from me today. I need to take it easy and get off the computer! Thanks for popping in. 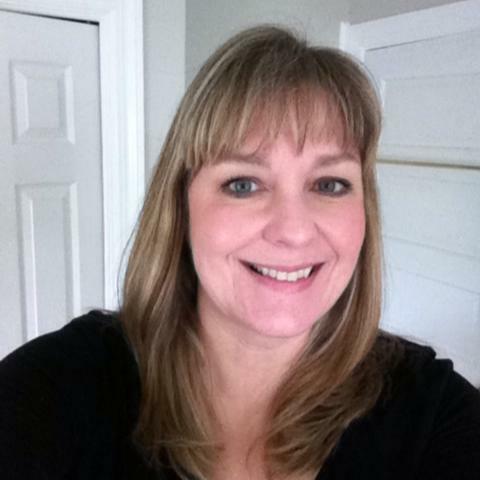 I really appreciate your visit! 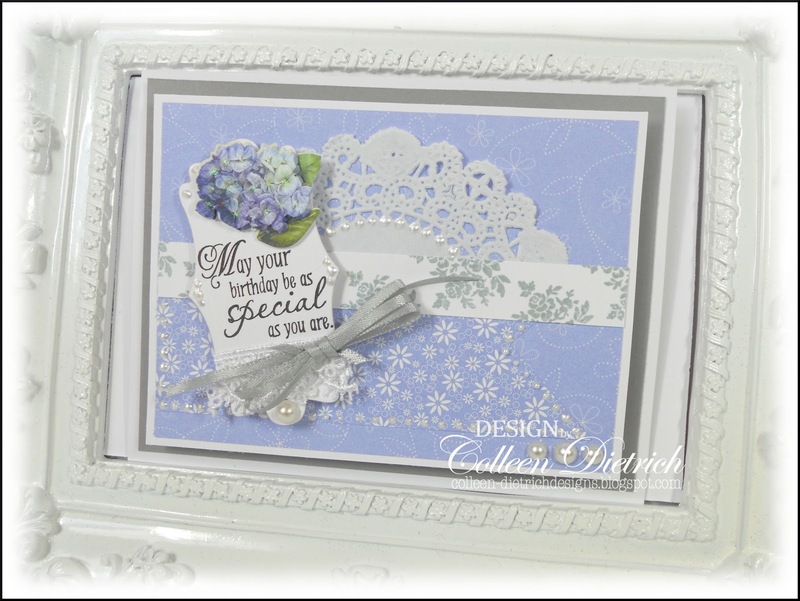 Beautiful card, Colleen! The doily is a perfect accent, as are the pearls! I hope you feel better soon. Take it easy, for sure! One word sums it up and that is gorgeous. That frame is amazing! I am feeling under the weather too! No crafting for me today at all...blah! So pretty Colleen! The doily is perfect for the sketch! Love your tag and bow too! The frame is beautiful! Hope you feel better! Beautifully done, Colleen. Great color combo and the doily is a great touch. Oh my, this is stunning! 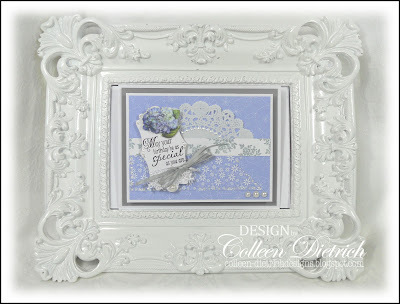 That frame is gorgeous, but I think the beautiful colors of your card really draw your eye there! I'm sure that your mom will adore this! Very pretty card! I didn't even notice the frame at first as I was drawn to that great doily and the color! Hope you are feeling better, this crazy weather is causing lots of allergy complaints and sinus related headaches. We had snow on Sunday and yesterday I think it was 60 degrees! Love the soft colors. Cool frame. Hope you are feeling better. Sometimes when I have a bad headache I put an ice pack on for 15 min. And I feel much better. Hugs! Aww feel better my friend, you'll be in my thoughts and prayers. I love your pretty card with the sweet hydrangeas! I thought the frame looked beautiful--but now I am looking forward to seeing it with other fabulous creations! This is a perfect spring creation---and I hope the allergies ease up for you! Thanks so much for playing with the Paper Players this week! Such an elegant card Colleen! Those flowers are so pretty and love the sentiment tag! Very pretty, whether it stays in the frame or not. The amethyst does look wonderful with the white. Great sketch. I love all these sketches you use. I sure hope you're feeling better today. Darn allergies! Hope you are feeling better today. What an amazing card. It is just beautiful. I love you embellies and that color is beautiful. What an awesome frame. What a find from TJ!!! This is beautiful Collen, love the doily mat and the beautiful lilac colours. Colleen, this is delightful!! You've used such pretty shades of blue, and I love all the special little touches you added: the pearls :), the glitter, the lace! And your multi-loop bow looks amazing!!! Thanks you SO much for playing along in my Guest Blogger challenge over at Do More With Less!!! What a beautifully feminine card, Colleen! 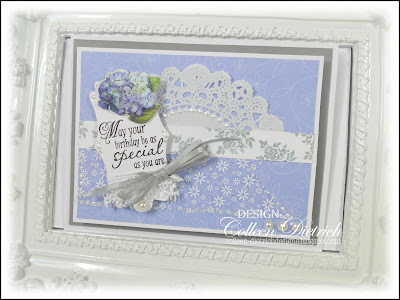 Love the blue and white and the pearl-accented doily is lovely! Thank you for joining us at The Paper Players this week! Such a pretty color and so feminine with the doily. 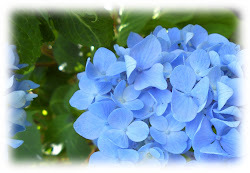 Isn't this a perfect color to go with hydrangeas?! That's a beautiful frame, Colleen. I love the colors on this card..so yummy and soft.